You guys are amazing. I had a lot of lovely responses to my last post and I want to thank everyone for your help. I was incredibly worried about that post, but you guys totally made me feel ok about my article idea. I was also stressing about another article, in which no one I wanted to interview had replied to me, so I went crazy contacting people today and I got a ton of replies. So I'm feeling a lot better about everything. It's been a crazy week. Also - why does the conditioner always run out before the shampoo? I mean, why? Now I have to buy one conditioner, but no shampoo. And I apologize for the insane amount of brownie photos this time. I was in love with them all. These brownies are amazing. 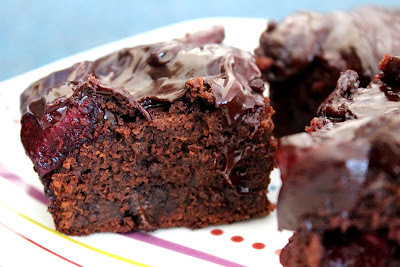 They are fudgy and dense and chewy - everything a good brownie should be. The chocolate is irresistably dark. The cherries add an extra kick. The ganache is delectably thick. I could go on forever. It's just easier for you to make these for yourself. They are also very easy to make - do not be scared by the long ingredient list or the long list of directions. It's very easy - it's pretty much my one bowl brownie mix with some cherries. Level of Difficulty: Relatively easy – do not be put off by the long directions! I was trying to be very thorough – these are very easy to make – pretty much need two bowls, a brownie pan and a tray. It just involves a bit of switching the oven temperature around. Menu Options: I’m sure you could change the fruit if you want, but I’m not sure how you would roast fruit or for how long. It would be best to stick with the cherries. You could totally change the type and quantity of the chocolate, but I find the dark chocolate the best. And the quantity works well with the cherries and chocolate ganache. No nutritional value this time guys – I’m sure we all know these are not healthy – but they are damn delicious. Preheat the oven to 230 degrees Celsius. Grease a brownie pan and line it with parchment paper. I always advise this because it so easy to remove the brownies from the pan. Make sure the cherries are pitted correctly. In a small bowl, combine the cherries with the 1 tbsp of brown sugar. Mix well. Place on a baking tray (well oiled) and bake the cherries for approximately 10 minutes. When the cherries are done, juices will be flowing from the fruit and they will look a darker red. Change the temperature on the oven to 200 degrees Celsius. 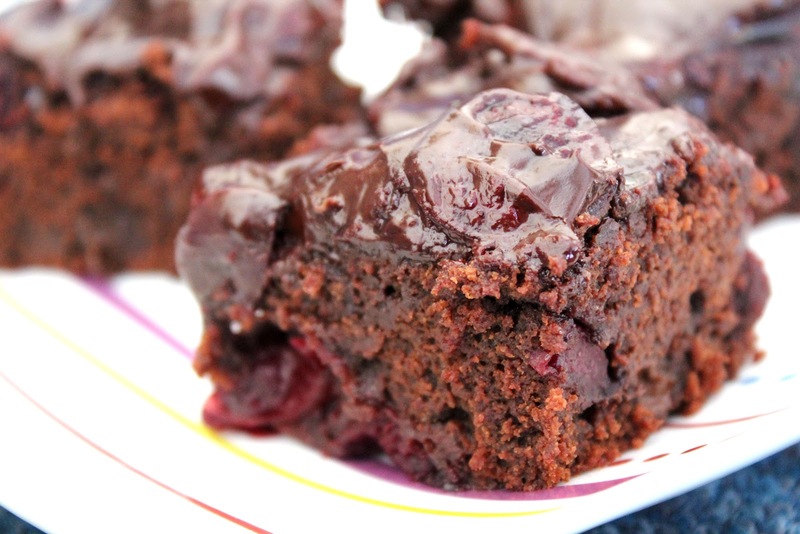 While the temperature is cooling down, or while the cherries are roasted, prepare the brownie mixture. Sift the flour and salt into the mixture and using a wooden spoon, stir the mixture together. Be careful here not to overmix the brownie batter. Stir the chocolate bits and roasted cherries into the mixture. Make sure both ingredients are evenly spread throughout the brownie batter. Pour the batter, which should be heavy and thick, into a brownie pan. Place in the oven and cook for 20 - 30 minutes. Keep an eye on the brownies after 20 minutes because you don’t want the edge of the brownies to burn. As there are cherries in the mixture, it may need to cook for at least 25 minutes. This will depend on the oven though. The mixture may seem slightly undercooked when you first take it out of the oven, but once it has cooled the brownies remain fudgy yet firm. Allow the brownies to cool for 10 minutes, while changing the oven temperature back to 230 degrees Celsius. 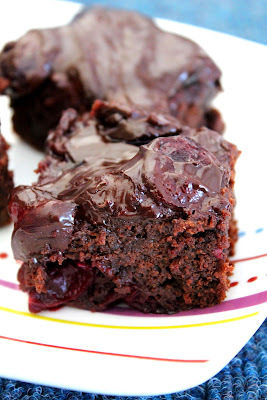 While the brownies are cooling, make the roasted cherry ganache. Follow the initial step when making the roasted cherries – combine the pitted cherries and brown sugar in a bowl, and then roast in the oven for approximately 10 minutes. 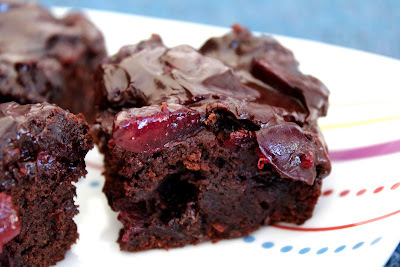 Once the brownie has cooled slightly – it does not have to be fully cooled – pour the roasted cherries over the brownie mixture. Using a wooden spoon or spatula, whichever is easier, spread the cherries over the entire brownie surface. Leave this to cool. Meanwhile, in a small saucepan over medium-high heat, mix the cream and dark chocolate together to make ganache. The ganache will be done when the mixture has turned a dark brown and is really thick. Take the ganache off the heat and allow to cool for a moment. Then, pour the ganache over the brownie base and roasted cherry. Very carefully spread the ganache so it covers the entire surface of the brownie. It should cover most of the cherries, but some will stick out. These look a-mwh-zing! I have bookmarked this recipe, yum!